Home » Blog » Can You File Bankruptcy for U.S. Debts in Canada? Canadians have always had a strong relationship with our southern neighbours. This can create an financial obligation owing to a US company. Many people living in border towns work and shop in the United States. They may have a US credit or store card like a Macy’s, Coles’ or Target credit card. You may have attended school in the United States then returned to Canada for work. Others may have a business or assets that cause them to travel to the US and they may incur US debts related to that. Or you may be an American citizen moving to Canada and leaving behind US debts. What happens then when you have US debts and work or live in Canada? 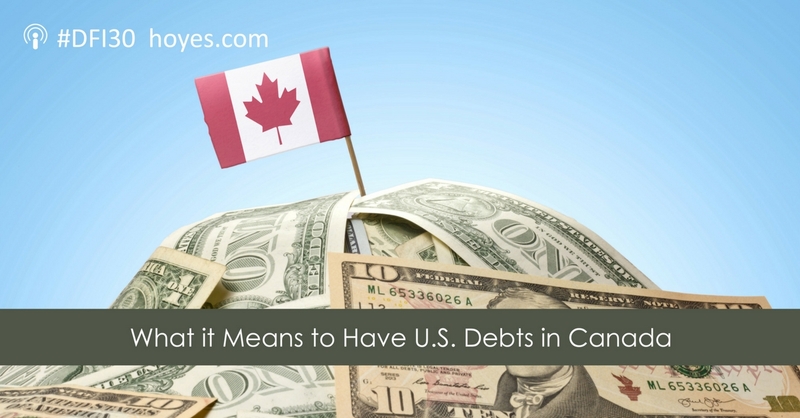 How are US debts treated in a bankruptcy in Canada? If you have assets or earn income in the U.S., collection will start with the country of origin. Your US creditors can, and likely will, pursue you in that jurisdiction. The same applies for debts owed to any foreign jurisdiction. If you owe a foreign debt, your creditors will pursue you legally in the country where the debt originated if you have assets or income in that country. It’s important to know however that there is no automatic cross-border collections. If you live in Canada and default on payment of a US debt, your US creditors will call you in Canada to collect and send notification letters through the US mail but it’s expensive for them to sue you across an international border to collect against your Canadian income or Canadian assets. To pursue you for collection in Canada, a US creditor would first have to obtain a judgment in the United States, then bring that judgment to a Canadian court to have the debt acknowledged in Canada. Because it’s complicated and costly, most US creditors won’t bother to pursue you legally if the debt is small. If you work in Canada, that means it’s also difficult for a US creditor to garnish your Canadian wages since they would have to work through the Canadian court system to do so. A Canadian Licensed Insolvency Trustee is only licensed to file a consumer proposal or personal bankruptcy in Canada. A US Bankruptcy Trustee or Bankruptcy Attorney is legally able to file bankruptcy in a US Court. If you have significant US debts, and you live or work in Canada, you may have to speak with both a Canadian and US bankruptcy trustee. If you have income or assets in Canada you might need to file a consumer proposal or bankruptcy with a Canadian trustee. If you file a proposal or bankruptcy in Canada, your US debts are included. The stay of proceedings means they cannot pursue you in Canada. Upon completion, your US debts are discharged however this applies only in Canada. If you also have income or assets in the US, your creditors can still pursue you in the United States for US debts even though you completed a bankruptcy in Canada. You will have to work with a US bankruptcy trustee to provide the same protection against your US assets and be discharged from those debts in that country. If you live in the US and have Canadian debts, please see our related article: Filing insolvency in Canada when living abroad. It is also important to know that the credit bureaus in Canada and the US have separate reporting systems. For example, Equifax US does not report to Equifax Canada and vise versa. So an unpaid debt in the US will not appear on your Canadian credit report. If you have both US and Canadian debts, your solution will depend on where you earn your income and where your assets are. Talk to a Licensed Insolvency Trustee for more information. Doug Hoyes: 90% of the Canadian population lives within 100 miles or 160 kilometres of the U.S. border. That means that we Canadians frequently travel to the U.S. and many Canadians who live in border towns actually work in the U.S. each day and return home to Canada each night. Our close ties to the U.S. are great when we want to be a tourist or a shopper or a worker but there is a down side. Some of us end up with U.S. debt. How does that happen? What can you do if you have U.S. debt? Does U.S. debt get included in a Canadian bankruptcy? Those are great questions. So, to find out I traveled today to Windsor, Ontario, which if there’s no traffic or line up at the border, is about a 12 minutes drive to downtown Detroit, Michigan. That’s very close. So, is it true that there’s a lot of Canadians who hop back and forth across the border every day? To find out I’m joined by Rebecca Martin, a Windsor resident and the trustee in charge of the Hoyes Michalos office in Windsor Ontario. Rebecca welcome back to the show. How are you doing today? Rebecca Martyn: I’m good thanks. Welcome to Windsor. Doug Hoyes: It’s great to be here. So, the reason I’m here is you’re the one who’s got the experience in dealing with people who’ve got debts both in Canada and the U.S.. So, let’s start with the basics, in your experience what are the typical scenarios that would cause someone to have debt either in the U.S. or denominated in the U.S. dollars? Rebecca Martyn: There’s basically three situations. If someone’s working in the U.S., they’re there every day, every other day or perhaps they went to school so they racked up U.S. debt when they were in school. Or they could just be people that like to go over occasionally to do some cross-border shopping. Doug Hoyes: And so, I mean I live closer to the Toronto area so I’m not near a border all the time. Is cross-border shopping still a thing? Rebecca Martyn: It is still a thing. Even personally I’ve noticed there’s a lot of products you can get in the U.S. that you can’t get here. So, it’s just easier to go across the border. Doug Hoyes: And so for you if you wanted to do that it’s like, you know, it takes five minutes to get across the border kind of thing, it’s not a big deal? Rebecca Martyn: Yeah on a good day, you wait five minutes you can go to whatever mall’s close by and get whatever you need. Doug Hoyes: And you’re back and you’re allowed to buy, you know, many hundreds of dollars of stuff on a trip so it’s not a big deal then. Rebecca Martyn: That’s exactly it. Doug Hoyes: So, it’s a common thing. Okay, so we’re not really talking about the people who cross the border to buy stuff and come back because they’re probably either paying cash or using their Canadian credit card. Doug Hoyes: So, that’s just like anybody else. It goes on my credit card, I pay for it at the end of the month. The people who have debt that’s in U.S. dollars would be for example people who worked in the U.S. and then got credit in the U.S.. Is that a common scenario? Rebecca Martyn: True but it’s not just the workers because a lot of the stores have store credit cards and they’ll use store credit cards to get additional discounts. So, even though you’re only there cross-border shopping, you might have for instance a Macy’s card, you use your Macy’s card you get 20% off or you might have a Coles’ card or Target card. You get 20% off, you carry that balance and bring it back home and now you have to figure out how to pay it off. Doug Hoyes: So if I’m a Canadian I can still get a Macy’s card or Coles’ card or whatever. Rebecca Martyn: Yes you can. Doug Hoyes: And now I’ve got U.S. debt that’s in the U.S.. so, are there any other scenarios we’ve missed then? So, the people that are working there, are there a lot of people who do cross the border each day and come back or is that pretty rare? Rebecca Martyn: No, I’m still seeing a lot. Not as many people are coming to us that were say coming to us five years ago just because of the exchange rate right now. It’s favourable for them to work in the U.S.. but back five years ago when it was dollar for dollar, all of a sudden they were realizing, okay I’m bringing home less money Canadian, I can’t manage my debts Canadian and U.S..
Doug Hoyes: Got you. So, it’s favourable to work in the U.S. now because you’re getting paid in U.S. dollars, which when you convert them to Canadian are a lot more. Like you say a few years ago is one to one so it was less of a deal. So, okay so let’s assume that someone is listening to us has U.S. debts for the reasons we’ve just talked about. And let’s assume that they can’t pay them. So, they’re getting behind and they’re starting to get collection calls and they’re afraid their wages are going to be garnisheed. What are their options, what can they do? And let’s maybe break this down in two pieces. So, let’s talk about someone who has all of their debts in the U.S.. So, either a whole bunch of U.S. credit cards or maybe it was someone who worked in the U.S. for a few years, which is why all their debts are there and now they’re back in Canada. So, that’s the scenario. U.S.. debts but they live in Canada. What are some – how would you advise someone like that? Rebecca Martyn: Well, there’s a couple of things they could do. I mean if they’re living in Canada, they’re working in Canada, they have U.S.. debts there’s no cross-border collections. Yes, the creditor’s going to call you but it’s extremely difficult and extremely expensive for someone to sue cross-border. And really are you going to sue someone cross border for a $3,000 U.S. debt? Doug Hoyes: So, you just hit on the key point then. You said, if I may quote you, there are no cross-border collections. Meaning if I owe money in the U.S.., the U.S.. creditor, the U.S.. company, credit card company, bank, whatever, is not going to come to Canada to try to collect. Rebecca Martyn: I mean theoretically they can but they have to get a judgment in the U.S., bring that judgment to Canadian court, have the Canadian court basically knowledge it. So, I’m sure you’re talking about tens or thousands of dollars to do that. Rebecca Martyn: No, I’ve never that happen. Doug Hoyes: You’ve never had that happen. And how long have you been in this business for? Doug Hoyes: Okay, so this is not like you just got into this business yesterday. You’ve had a lot of experience and you’ve never seen it. So, okay so it’s a very rare thing. So, let’s take the other scenario then that I’ve got, you know, maybe some debts in the U.S.. and some debts – well, actually let me do a real simple scenario. I still work in the U.S.., I still live in the U.S.., all my debts are in the U.S., then they don’t really need to talk to you. Rebecca Martyn: They don’t need to talk to me, they need to talk to a U.S.. bankruptcy attorney. Doug Hoyes: Okay. So, then they final scenario is I’ve got some debts in the U.S.., some debts in Canada. Okay, am I talking to a U.S. bankruptcy attorney, am I talking to you? Am I talking to both, what should I be doing in that scenario? Rebecca Martyn: You’re talking to both because depending on how much money you owe, you might need to do a consumer proposal or bankruptcy in Canada and you might need to do a bankruptcy in the U.S.. as well depending on how much you owe and what the chances are of someone going after you. Doug Hoyes: So, let’s take a scenario where I’ve got, I don’t know, ten, twenty thousand dollars of U.S. debts and maybe 40, 50 thousand dollars worth of Canadian debts. And let’s assume I can’t pay it. There’s no way I can pay them. I’m working in Canada, I’m afraid my Canadian wages are going to be garnisheed by my Canadian creditors so I come in to see you, we file a consumer proposal. What happens to my U.S. debts then? Are they included in that Canadian consumer proposal? Rebecca Martyn: They are. But they likelihood of them understanding it, unfortunately is very small. They’re still included in your proposal, there still is that stay of proceedings so they cannot pursue you in Canada for the debt. The issue that you face is if you every work in the U.S.. again, if you ever have assets in the U.S.. again, those are still up for grabs. Doug Hoyes: So, the answer to the question depends on what the future holds for you. Doug Hoyes: If you’re back in Canada, you’re not going to be working in the U.S.. okay, it’s almost doesn’t matter what your debts are there because they can’t come to Canada very easily and collect from you. Doug Hoyes: And this stay of proceedings you talk about, that means once I file a proposal or a bankruptcy no one can sue me. Doug Hoyes: And – but we’ve already said that if they’re U.S.. debts, they’re probably not coming over here to sue you anyways. Doug Hoyes: So, for U.S.. debts when you live in Canada, work in Canada, not that big a deal then. Are – so, U.S.. debts are included? Doug Hoyes: But it almost has no affect. Doug Hoyes: Okay. Now something that would have an affect though would be my credit report. Because if I just have Canadian debts and stop paying them, even if I don’t have a job, okay so no one can garnishee my wages. Maybe I don’t care but that’s going to be reported on my Canadian credit report, it’s going to affect my ability to borrow in the future. If I have the U.S.. debts and just decide not to pay them, how is that going to affect my U.S.. credit report? How is that going to affect my Canadian credit report? Are they the same thing? Rebecca Martyn: No they are not; they’re two different reporting systems. Even though they’re both Equifax, Equifax U.S.. doesn’t report to Equifax Canada so you’ll have a negative U.S.. credit rating because you’re not paying your debts but those U.S.. debts will not show up on your Canadian credit report. Doug Hoyes: So again, I don’t really need to worry about it is what it comes down to. If I’ve got U.S.. debts and I don’t pay them, it’s not going to affect my Canadian credit report. Doug Hoyes: And if I have some reason to need a U.S.. credit rating in the future then okay, then I should be dealing with them. But otherwise it’s just not that big a deal. Doug Hoyes: Have you ever had cases where the U.S.. collection agents are phoning people in Canada? Rebecca Martyn: I do. Admittedly they’re a little bit more work because they don’t understand what a consumer proposal is because they don’t have such a thing as a consumer proposal. So, it’s just explaining to them what the equivalent is in the U.S.., that they’re still entitled to file their paperwork but they can’t call the client anymore to try to collect. And usually they – calls do stop. It does take them a little bit longer but they do stop. The creditor still is allowed to file their proof of claim and get their dividend. Doug Hoyes: So, that’s a key point then. In my scenario where I’ve got ten thousand dollars worth of U.S.. debts, 40 thousand dollars worth of Canadian debts, I would file a consumer proposal in Canada for 50,000. It would cover all 50,000 of the debts. And if a creditor in the U.S.. files a claim with us they can get their share of the money just like everyone else does. Doug Hoyes: That’s how it works and that’s what you would do I assume. You would put them on anyways. Doug Hoyes: So, if I have a bunch of U.S.. debts couple of choices then I’ve got a couple of choices. In Canada my obvious choices are I can file a bankruptcy or I can file a consumer proposal. Consumer proposals don’t exist in the U.S.. And we’re not here to give U.S.. bankruptcy advice because we’re not experts in that but what are the equivalent in the U.S.. of bankruptcies and consumer proposals. Rebecca Martyn: So, they have a bankruptcy code and there’s two codes that apply to individuals. A Chapter Seven is very equivalent to our bankruptcy where it’s basically to liquidate your assets, pay your debts. Their Chapter 13 is similar to a consumer proposal where you offer repayment plan to your creditors. Doug Hoyes: And if you are – if you do have U.S.. debts and you’re considering this then you already hit it at the start, you better talk to a U.S.. bankruptcy attorney. In Canada attorneys or lawyers don’t do bankruptcy work. Doug Hoyes: You’re not an attorney, you’re not a lawyer, you’re – you have an accounting background as do I. And obviously, you’re also a Licensed Insolvency Trustee, which allows you to do this. In Canada we have a special rule that says lawyers can’t do this. It’s a great rule, it’s like the best rule ever. But in the U.S.. it’s all done by lawyers. Doug Hoyes: So, you’d have to consult with a bankruptcy lawyer and the rules are completely different in the U.S.. In Canada when you go bankrupt you have to report your income each month and the more you make, the more you end up paying. In the U.S.. that whole means testing is done before you even file. If you make too much money they won’t even let you file a bankruptcy. So that’s a completely different system. You’ve got to get specific advice there. So, are there any other things that pop into your head then Rebecca about this issue of U.S..? Maybe you can just kind of close by someone comes in, they’ve got U.S.. debts, they’re working in Canada, they’re not planning to go back to Canada. What’s your general basic advice to them? Rebecca Martyn: So, what I basically do is I’ll sit down, I’ll look at them, what are your U.S. debts? What are your Canadian debts? What are you planning for the future, are you planning on working back to the U.S.., are you planning on retiring there? Do you own anything over there? And then we look and see what makes more sense for you just doing something over here, doing something over here and doing something in U.S.. and then we’ll just figure out what options best for them. Doug Hoyes: Because there are a bunch of permutations obviously. How much debts here, how much debts there, are you going back there, are you going to be working there? What if you have assets in the U.S.? how does that affect either a Canadian bankruptcy or debts in the U.S. in general? Would that change your answer? Rebecca Martyn: It would change the answer because when you file bankruptcy you have to disclose your assets anywhere in the world. They don’t just have to be in Canada. They could be anywhere. So, if you have assets in the U.S.. those assets are still at risk. But then there could become a bit of a conflict between who has first dibs to it, your Canadian bankruptcy or your U.S.. bankruptcy. So, it gets complicated. Doug Hoyes: And again in a situation like that then you’ve got to get expert advice because it gets complicated. What we’re trying to do here is give a bit of an overview. If you’ve got specific questions about this then obviously give us a call or find a U.S.. bankruptcy attorney. Doug Hoyes: Excellent, well great. That’s a great way to close the show. Rebecca thanks for being here. So, there you have it right from the expert on U.S. debt, Rebecca said if all you have is U.S. debt, then the solution may be a Chapter Seven, bankruptcy in the U.S.. or a Chapter 13 wage earner plan, which is similar to what we call a consumer proposal and you’d file those in the U.S.. If you have both U.S.. and Canadian debt the answer will depend on whether or not you plan to continue working and having income in the U.S.. or if you have assets in the U.S.. There are many different permutations. So, your best option is to talk to either an American bankruptcy attorney or a Canadian Licensed Insolvency Trustee for more information. Rebecca can be reached on the web at hoyes.com or by calling Hoyes Michalos at 310PlAN, that’s 310-7526 and there’s no area code required anywhere in Ontario. That’s our show for today. Full show notes can be found on our website at hoyes.com where we’ve got links to help you contact Rebecca and links to all of your options with dealing with debt. Thanks for listening. Until next week, I’m Doug Hoyes, that was a technical tidbit edition of Debt Free in 30. Should You File Bankruptcy in Canada if Living Abroad?